Every morning of camp, we come together to share our gratitude towards one another through the Thank You Bowl. At TLC, everything we do is centered around giving thanks to others. It is where everything starts and everything ends. Everything. Our daily Thank You Bowl where we draw from the bowl and read each morning thank you notes campers have written for staff and staff have written for campers. Our random Gratitude Minutes at camp, which come in the middle of intense drills and everyone drops to the ground for a minute to think of what they are grateful for. Our staff meetings where we begin each meeting with staff throwing out thanks to other staff members for the little (and big) things they did to make the acknowledger’s life a little better. Without them, we are just tennis players running around in funny outfits hitting a little ball back and forth (or, in my case, into the net). With them, we are our better selves. Every morning for many years, since I get up earlier than my wife and daughter (5 AM, hard to get anyone up earlier than that), I start the day by making my pot of decaf coffee (My wife says why do you even bother? I say you do not want to see me on caffeine) and a handwritten note, a short note, a love note, I guess you would call it, but it really is about being thankful for what they mean to me. When my daughter is not here, I just write my wife. This morning, our daughter is coming home from college for Thanksgiving weekend. And what I wrote to my wife today – over decaf – was the truth about what having them in my life does. But first, let me tell you what having them in my life does not do. It does not make difficult things go away. It does not protect me from circumstances that might happen during a day (a rude store clerk, a disrespectful colleague, an escaped carjacking – to which I must just add a note from personal experience, do not pick up strangers!!! ); cancer of a friend (or who knows, maybe me someday? ); it does not cure depression, it does not prevent people from dying, because, secret here, all people do eventually die; it does not prevent mean people from being mean, it does not make cheaters not cheat; it does not erase my own mistakes when I speak an unkind word or do an unkind deed; it does not prevent painful things in life from occurring, or even recurring. Campers and staff taking a moment of reflection during the Gratitude Minute. What it does do is this. (And, by the way, I discover new things each time I write a short note, so that is a benefit to me every morning by having me focus outside myself to start the day, no matter how I am feeling). I will let the note speak for itself. “I am so glad to be a part of your life. Perhaps being grateful does not protect us from life’s slings and arrows. But it makes them easier to bear. Being grateful means we are forced to remember we are not in this battle alone. And that makes all the difference. So, today, first, I encourage you to write a short note of gratitude to someone who has helped you make the hard things in life easier and the good things in life better. Three sentences. It will take you two minutes away from your turkey or your football game. Second, I encourage you to – with your family or by yourself – set aside one minute. Just one. Set a timer. Stop everything. And just sit and be grateful for whatever you are grateful for. Third. Brew a pot of decaf so someone else other than myself can be made fun of. 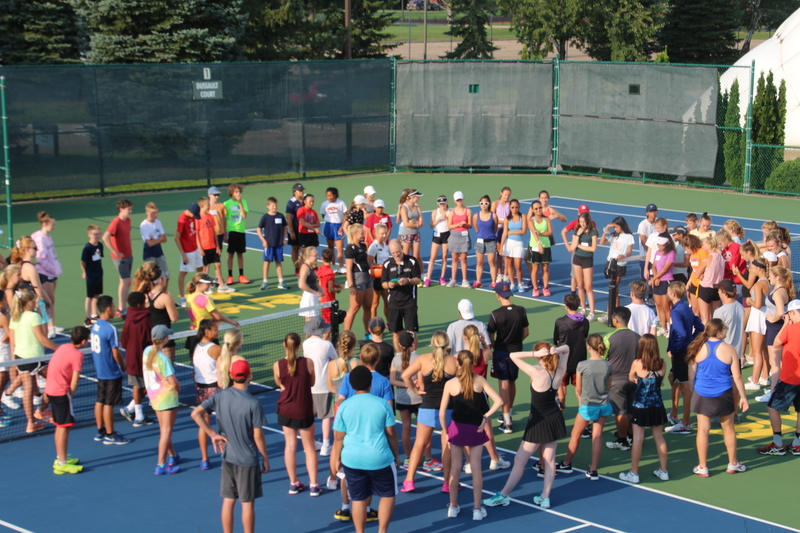 Happy Thanksgiving from Tennis & Life Camps. We are grateful you are a part of our mission. Oh, Colleen, our hearts go out to you. Though it will not take away your devastating loss, you will be surrounded by love and prayers from all TLCers who read this. 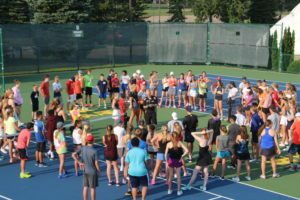 Thank you for the twenty years of fun, learning, comradeship, and pure joy of being able to attend tennis camp. Many are the memories – Steve, the Tornado’s displacement, Dave Aason as an instructor/bus driver, concerts by Neal and Leandra, and Neal with hair! 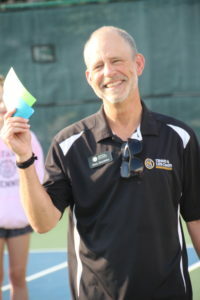 I no longer can take the many hours of tennis a day, but I still can manage six days a week – but I miss GVS!! Ann, we miss you, too! And I miss my hair, too! But, to be honest it’s a lot easier to care for when there is little to none there… You were here for so much of the history and are a part of us forever. Happy Thanksgiving! lol. Take it up with Leandra, Bev! Beautiful said Neal.i am grateful today for so many people and things in my life! I’m grateful for you and dragging the whole family here last summer! I was being busy today thinking about my brother, and giving thanks, and now I know that you make my brother have meaning. Thank you, Neil, for all your words and work. PS. I need my caffeine to speak, but I will brew a pot of decaf for our turkey dinner. John, You have made an impact on my life and the world like Steve did. You were a great brother. I am grateful that Coach Steve began TLC so many years ago. I know he continues to smile as you have continued to make TLC a place to learn, share, enjoy, and reflect. Thank you! You’re welcome, Deb. Thanks for all your support over the years and a great son who was one of our most wonderful campers and instructors!